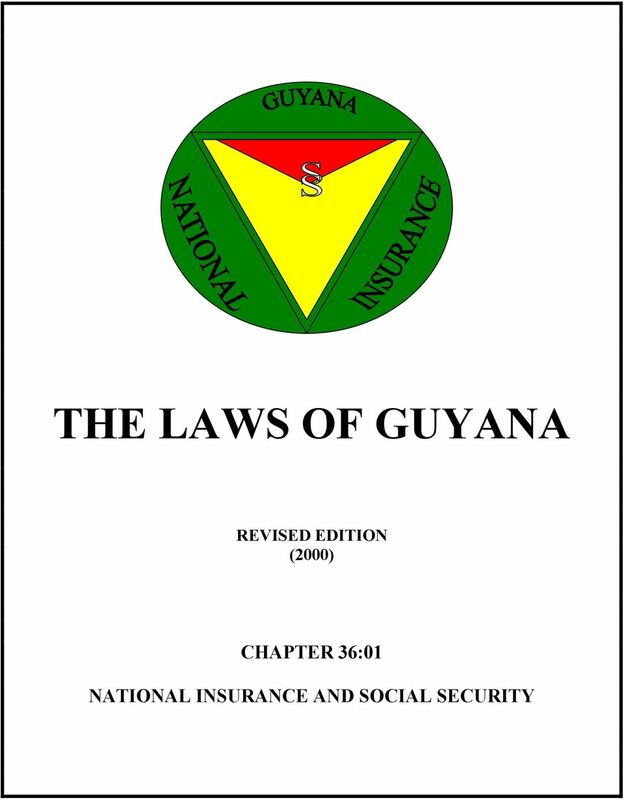 Download "THE LAWS OF GUYANA REVISED EDITION (2000) CHAPTER"
4 National Insurance and Social Security Cap.36:01 1 CHAPTER 36:01 NATIONAL INSURANCE AND SOCIAL SECURITY ACT ARRANGEMENT OF SECTIONS PART I PRELIMINARY SECTION 1. Short Title 2. 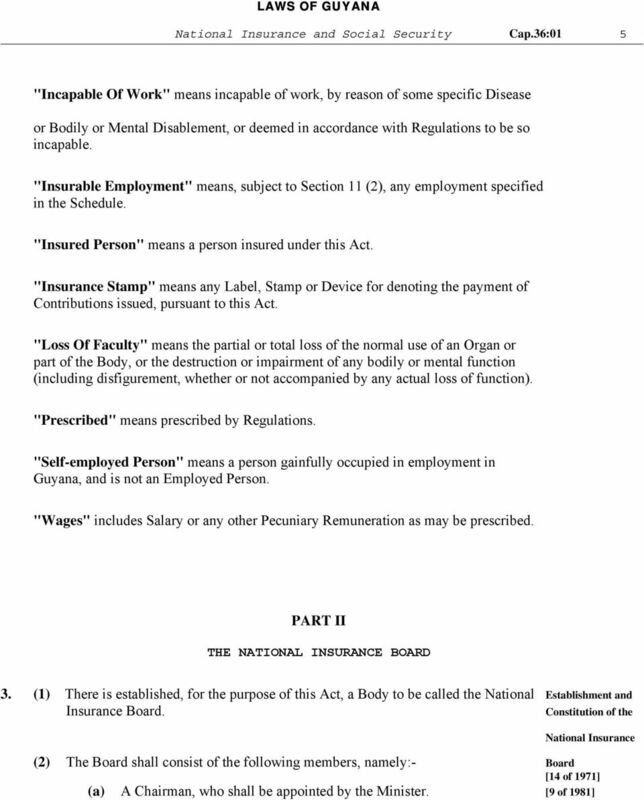 Interpretation PART II THE NATIONAL INSURANCE BOARD 3. Establishment and constitution of National Insurance Board. 4. Incorporation. 5. Affixing of Seal and authentication of documents. 6. Meetings of the Board and Procedure. 7. Power to appoint Committees. 8. Power to delegate. 9. Remuneration of Members, Co-opted Persons and Committee Members. 10. Protection of Board and its members. 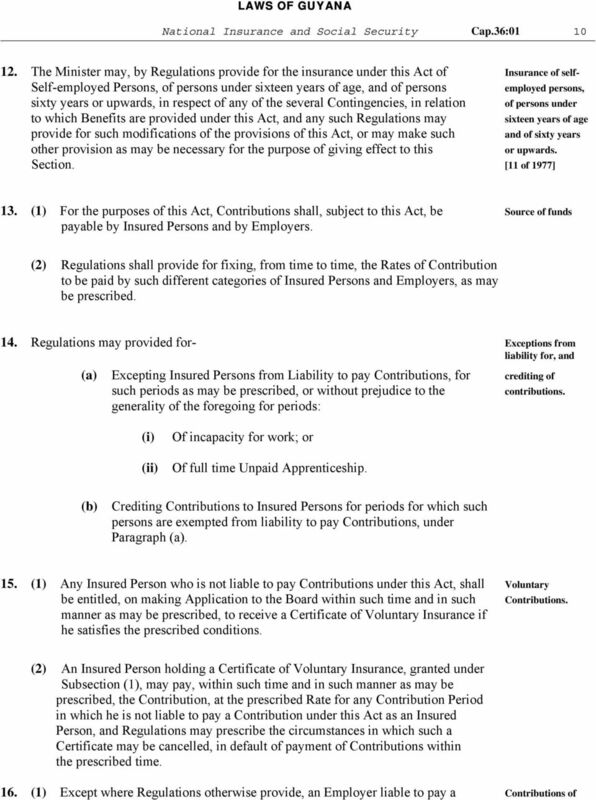 PART III INSURED PERSONS AND CONTRIBUTIONS 11. Persons to be insured. 12. Insurance of Self-employed Persons, of persons under sixteen years of age and of sixty years or upwards. 13. Source of funds. 14. Exceptions from liability for, and crediting of Contributions. 15. Voluntary Contributions. 16. Contributions of Employed Persons and Employers. 17. General provisions as to the payment and collection of Contributions, etc. 18. Persons to be treated as Employers. 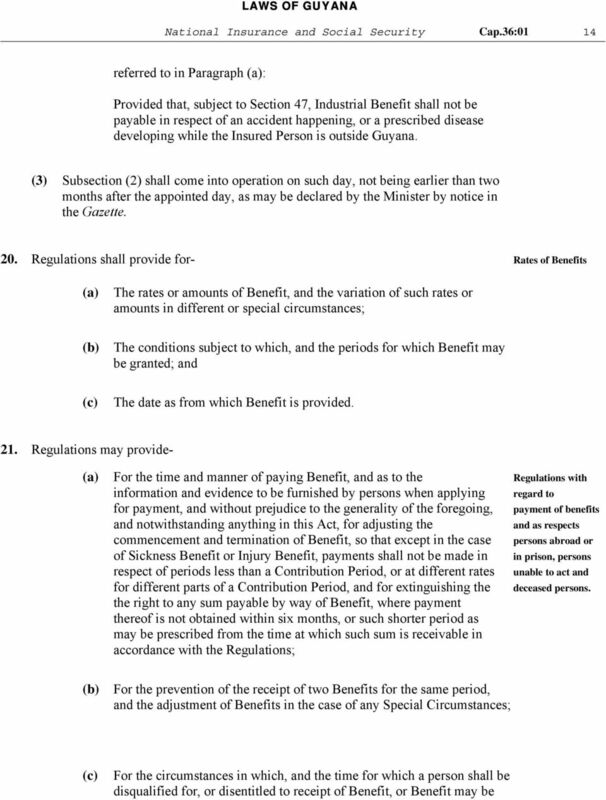 5 National Insurance and Social Security Cap.36:01 2 PART IV BENEFITS SECTION 19. Description of Benefits. 20. Rates of Benefits. 21. Regulations with regard to payment of Benefits and as respects persons abroad or in prison, persons unable to act and Deceased Persons. 22. Presumption and general provisions relating to Accidents. 23. Prescription of Diseases. 24. Regulations relating to Diseases and Medical Officers and Boards. 25. Payment of Medical Officers and Boards. 26. Accidents or Diseases in course of Illegal Employment. 27. Benefit where Disease is Personal Injury by Accident. 28. Repayment of Benefit improperly received. 29. Benefits to be inalienable. PART V ADMINISTRATION, FINANCE AND LEGAL PROCEEDINGS 30. Officers and Employees of the Board. 31. Designation and powers of Inspectors. 32. Proceedings against Officers and Employees of the Board under this Act. 33. Establishment of Fund. 34. Defrayment of initial Expenditure and meeting of temporary insufficiency in Fund. 35. Expenses of Post Office. 36. Report and Accounts to be submitted to Minister. 37. Review of operation of Act. 38. Determination of Claims and Questions. 39. Interim payments, Arrears and Repayments. 40. Payment of persons and Tribunals appointed or constituted under Section Offences and Penalties. 42. General provisions as to prosecutions under Act. 43. Recovery of Contributions on prosecutions under Act. 44. Civil proceedings to recover sums due to Fund. 45. Proceedings against Employer for Benefit lost by Employer's default. 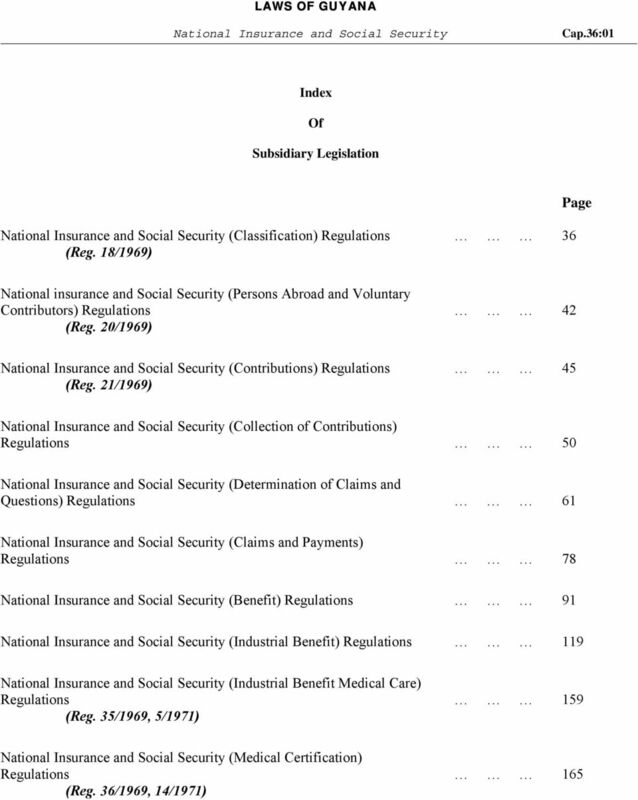 7 National Insurance and Social Security Cap.36:01 4 PART I PRELIMINARY 1. 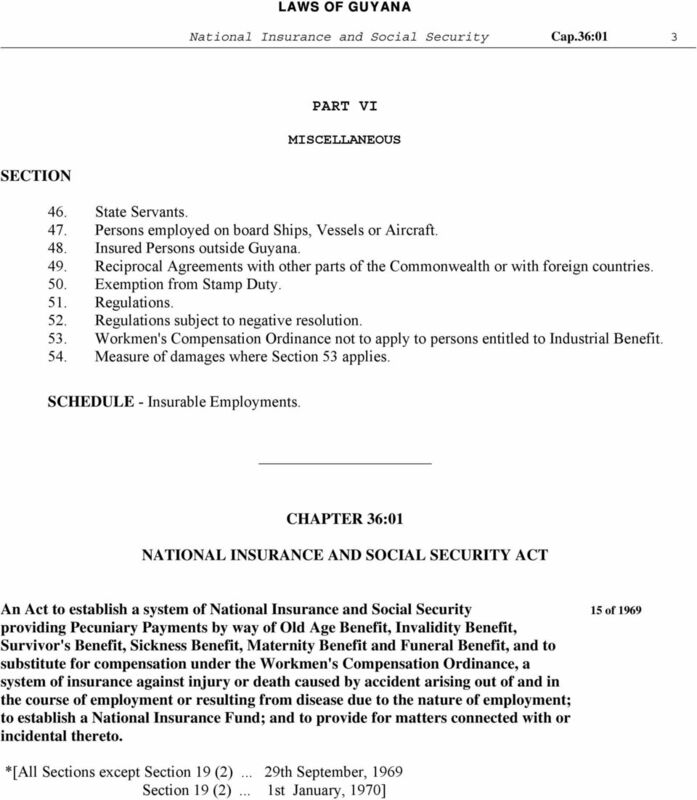 This Act may be cited as the National Insurance and Social Security Act, and subject Short title. to Section 19 (3), shall come into operation on a date to be appointed by the Minister by notice published in the Gazette. 2. In this Act- Interpretation [14 of 1971 "The Administration" means the Co-operative Finance Administration, 9 of 1981 established by Section 3 of the Co-operative Financial Institutions Act. 15 of 1989] Cap. 75:01 "Appointed Day" means the day appointed under Section 1, for the purpose of bringing this Act into operation. "Benefit" means Benefit which is payable under this Act. "The Board" means the National Insurance Board, established by Section 3. "Contribution" means a Contribution payable, pursuant to this Act. "Insurance Stamp" means the Card issued by the Board, for the purpose of the payment of Contributions by means of Insurance Stamps affixed thereto. "Contribution Period" means the prescribed period, in respect of which a Contribution is payable. "Declared Day" means the day declared under Section 19 (3), for the purpose of bringing Subsection (2) of that Section into operation. "Disease" includes Personal Injury not caused by Accident, and any condition which has resulted from a Disease or Personal Injury. 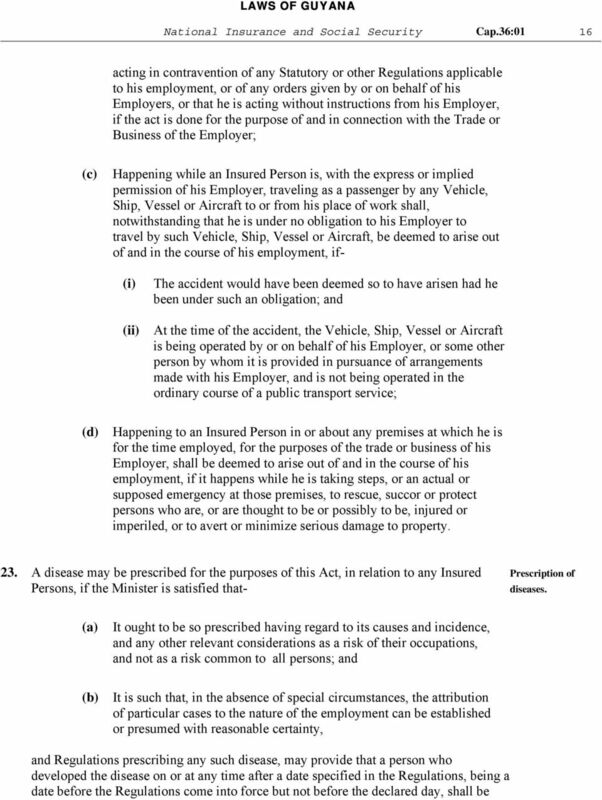 "Employed Person" means any person who is insured under this Act, by virtue of Section 11 (1). "The Fund" means the National Insurance Fund, established by Section 33. 10 National Insurance and Social Security Cap.36:01 7 (3) The Chairman or, in his absence, the Deputy Chairman shall preside at all meetings of the Board. (4) The Chairman or, in his absence, the Deputy Chairman, and four other members shall form a Quorum. (5) The decision of the Board shall be by a majority of votes, and in addition to an Original Vote, in any case in which the voting is equal, the Chairman or Deputy Chairman presiding at the meeting shall have a Casting Vote. (6) Minutes, in the proper form of each meeting, shall be kept by such Officer of the Board as the Board may appoint for the purpose, and shall be confirmed by the Board at the next meeting, and signed by the Chairman or the Deputy Chairman as the case may be. 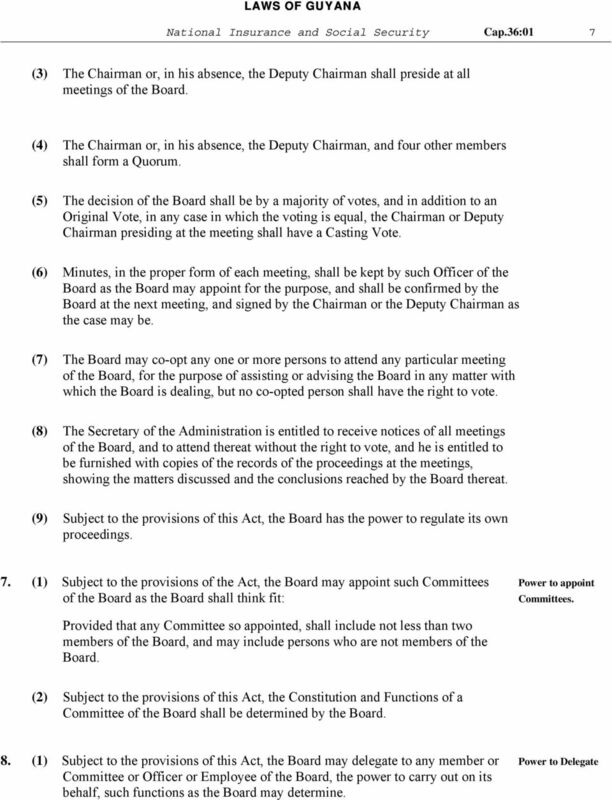 (7) The Board may co-opt any one or more persons to attend any particular meeting of the Board, for the purpose of assisting or advising the Board in any matter with which the Board is dealing, but no co-opted person shall have the right to vote. (8) The Secretary of the Administration is entitled to receive notices of all meetings of the Board, and to attend thereat without the right to vote, and he is entitled to be furnished with copies of the records of the proceedings at the meetings, showing the matters discussed and the conclusions reached by the Board thereat. (9) Subject to the provisions of this Act, the Board has the power to regulate its own proceedings. 7. (1) Subject to the provisions of the Act, the Board may appoint such Committees Power to appoint of the Board as the Board shall think fit: Committees. Provided that any Committee so appointed, shall include not less than two members of the Board, and may include persons who are not members of the Board. (2) Subject to the provisions of this Act, the Constitution and Functions of a Committee of the Board shall be determined by the Board. 8. (1) Subject to the provisions of this Act, the Board may delegate to any member or Power to Delegate Committee or Officer or Employee of the Board, the power to carry out on its behalf, such functions as the Board may determine. 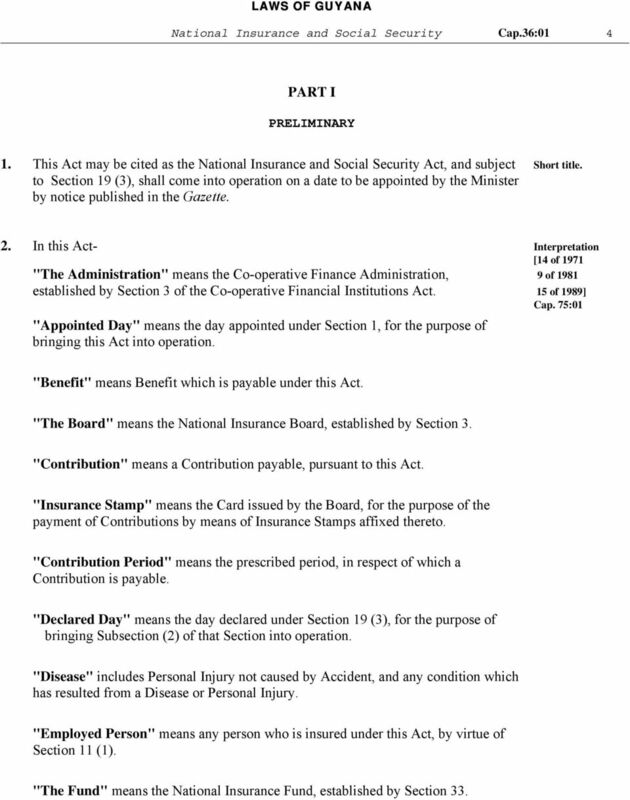 11 National Insurance and Social Security Cap.36:01 8 (2) Every delegation under this Section, shall be revocable by the Board, and no delegation shall prevent the exercise, by the Board, of any function. 9. 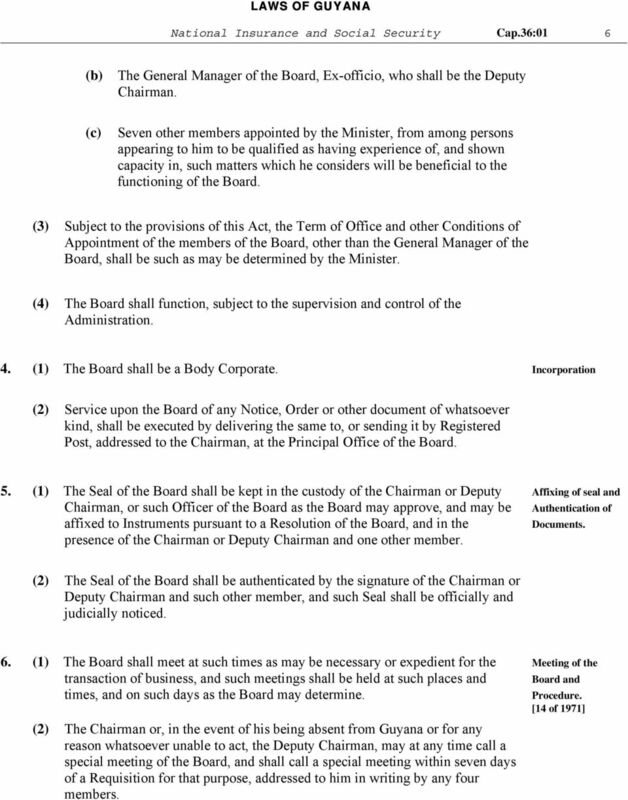 The Board shall pay- To each member, in respect of his Office as such, such Remuneration Remuneration of and Allowances (if any) as the Administration may determine, and to the Chairman and to the Deputy Chairman, in respect of his Office as persons and such, such Remuneration and Allowance (if any), in addition to any committee Remuneration or Allowances to which he may be entitled, in respect members his Office as a of member, as may be so determined. [14 of 1971] [9 of 1981] To any person co-opted under Section 6 (7), and to any person not being a member of the Board, serving on a Committee appointed under Section 7, such Remuneration and Allowances (if any) as the Board, with the approval of the Administration may, by resolution Declare. members, co-opted 10. (1) No act done, or Proceedings taken under this Act, shall be questioned on the Protection of ground- Of the existence of any vacancy in the membership, or any defect in the Constitution of the Board; or Board and its Members. Of any omission, defect or irregularity not affecting the merits of the case. (2) No Action, Suit, Prosecution or other proceedings shall be brought or instituted personally against any member of the Board, in respect of any act done bona fide in pursuance or execution or intended execution of this Act. 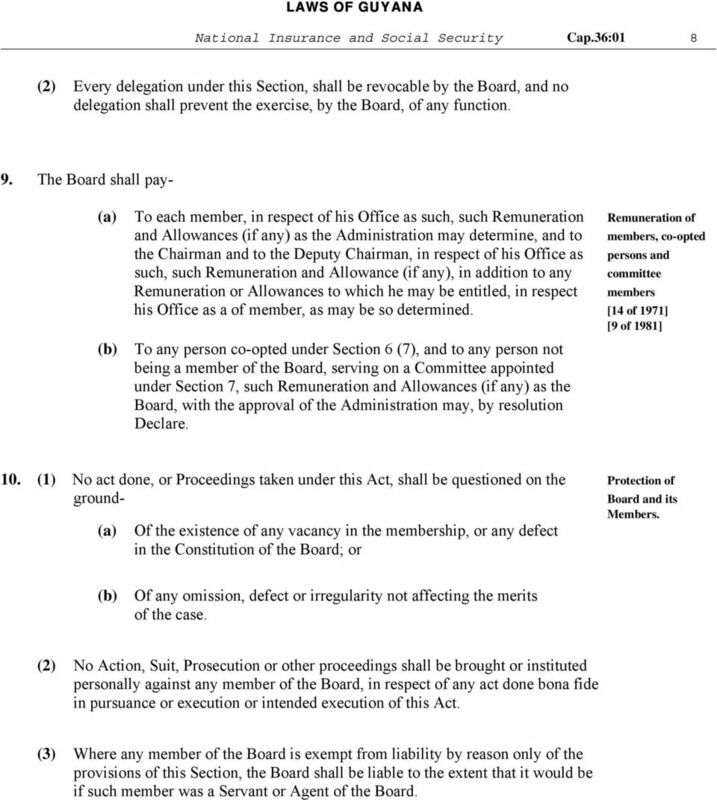 (3) Where any member of the Board is exempt from liability by reason only of the provisions of this Section, the Board shall be liable to the extent that it would be if such member was a Servant or Agent of the Board. 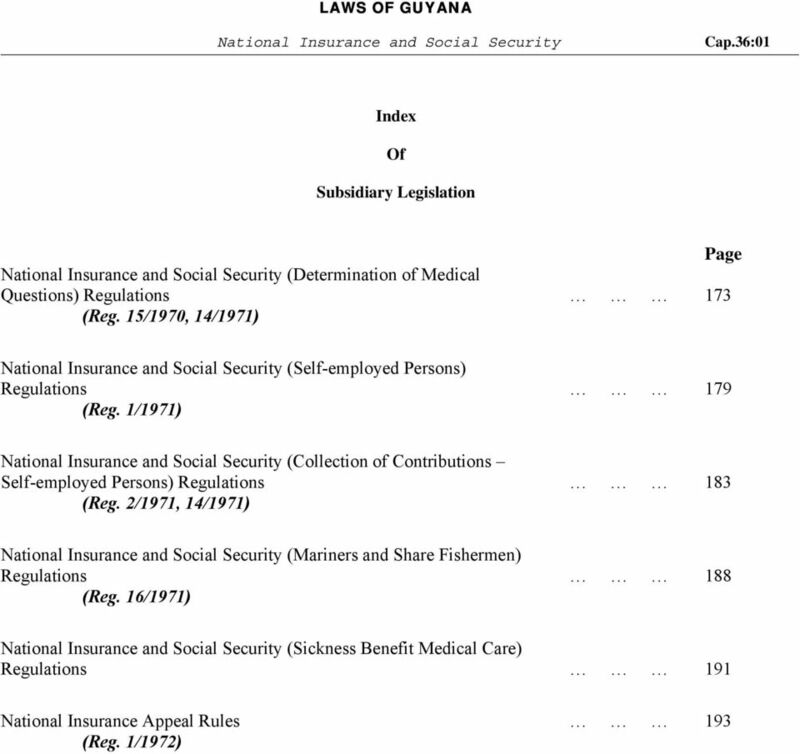 12 National Insurance and Social Security Cap.36:01 9 PART III INSURED PERSONS AND CONTRIBUTIONS 11. 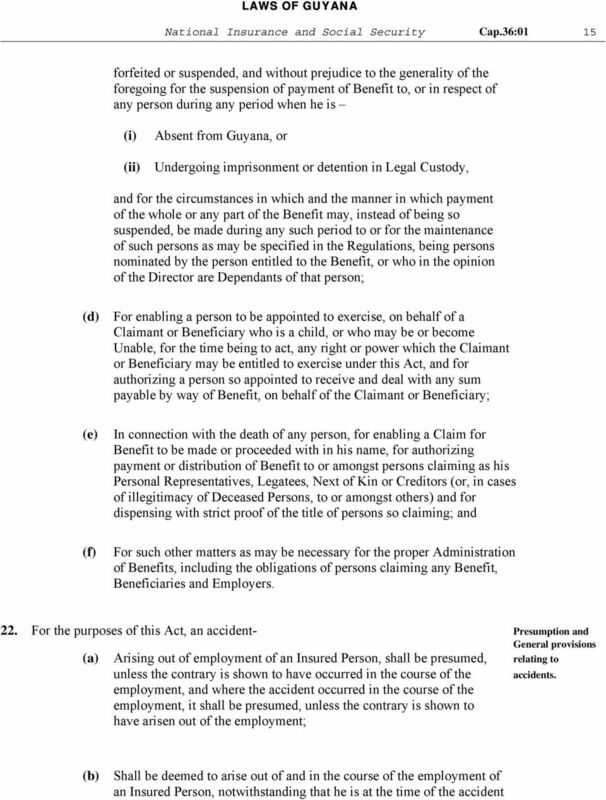 (1) Subject to this Act, every person who on or after the appointed day is- Persons to be insured. Sixteen years of age or over and under sixty years of age; and [11 of 1977] Gainfully occupied in Insurable Employment, shall be insured under this Act, and shall remain so insured for life. 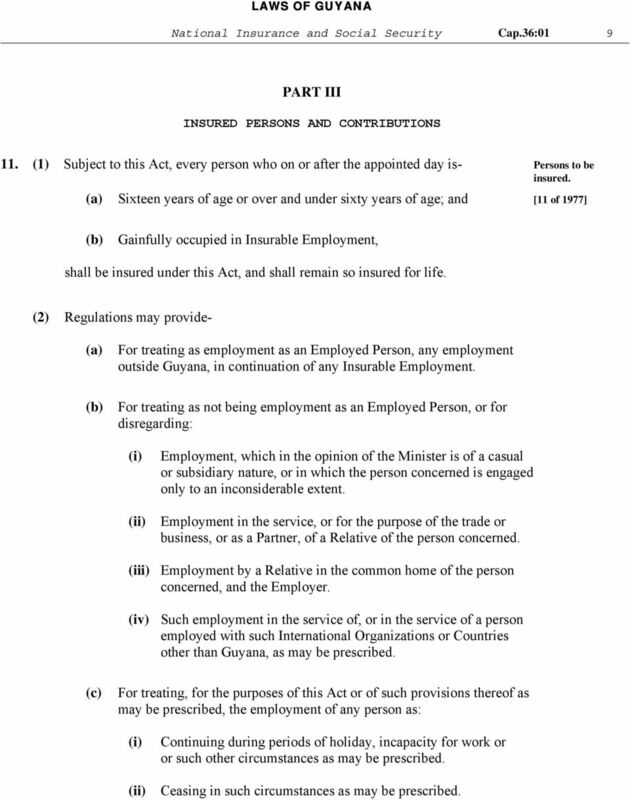 (2) Regulations may provide- For treating as employment as an Employed Person, any employment outside Guyana, in continuation of any Insurable Employment. For treating as not being employment as an Employed Person, or for disregarding: (i) (ii) Employment, which in the opinion of the Minister is of a casual or subsidiary nature, or in which the person concerned is engaged only to an inconsiderable extent. Employment in the service, or for the purpose of the trade or business, or as a Partner, of a Relative of the person concerned. (iii) Employment by a Relative in the common home of the person concerned, and the Employer. (iv) Such employment in the service of, or in the service of a person employed with such International Organizations or Countries other than Guyana, as may be prescribed. (c) For treating, for the purposes of this Act or of such provisions thereof as may be prescribed, the employment of any person as: (i) (ii) Continuing during periods of holiday, incapacity for work or or such other circumstances as may be prescribed. Ceasing in such circumstances as may be prescribed. 20 National Insurance and Social Security Cap.36:01 17 treated for the purposes of this Act, subject to any prescribed modifications, as if the Regulations had been in force when he developed the disease. 24. Regulations may provide for- Regulations relating to Diseases Determining the time at which a person is to be treated, for the and Medical purposes of this Act, as having developed any prescribed disease, and Officers. the circumstances in which any such disease is, where the person in and boards. question has previously suffered there from, to be treated as having recrudesced or having been developed afresh; Presuming any prescribed disease- (i) (ii) To be due, unless the contrary is proved to the nature of the employment of any person where he was employed in any prescribed occupation at the time when, or within a prescribed length of time (whether continuous or not) before, he developed the disease; Not to be due to the nature of the employment of any person, unless he was employed in some prescribed occupation at the time when, or within a prescribed length of time (whether continuous or not) before he developed the disease; (c) (d) The appointment of Medical Officers and the establishment of Medical Boards, for the purpose of this Act; and Such matters as appear to the Minister to be incidental to, or consequential on provisions included in the Regulations, by virtue of the foregoing provisions of this Section. 25. 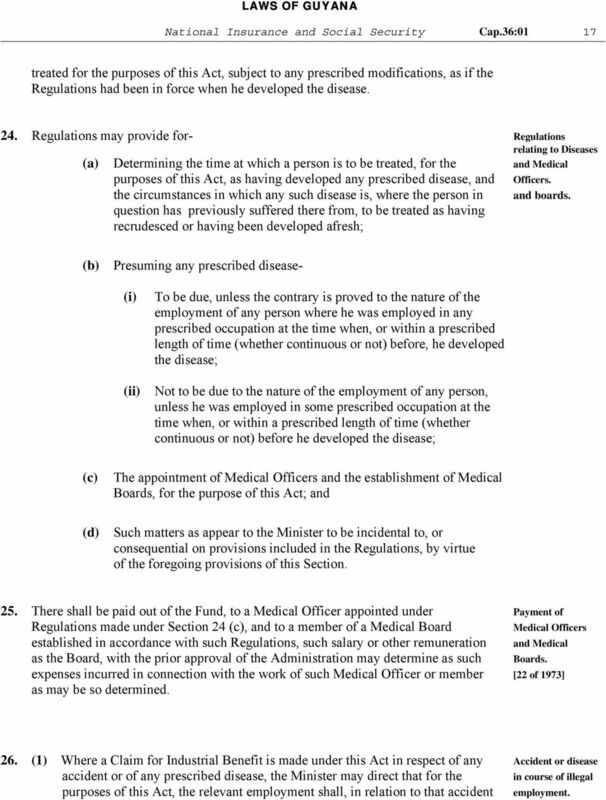 There shall be paid out of the Fund, to a Medical Officer appointed under Payment of Regulations made under Section 24 (c), and to a member of a Medical Board established in accordance with such Regulations, such salary or other remuneration as the Board, with the prior approval of the Administration may determine as such Boards. expenses incurred in connection with the work of such Medical Officer or member [22 of 1973] as may be so determined. Medical Officers and Medical 26. 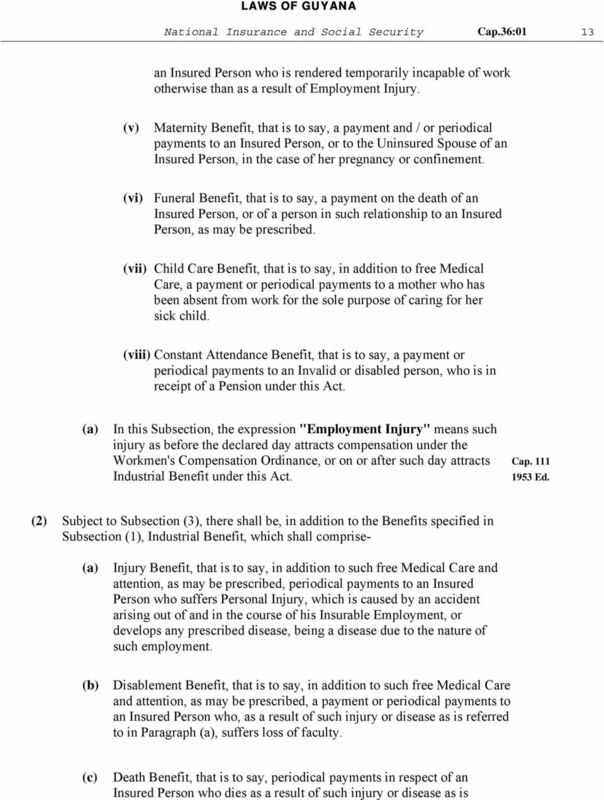 (1) Where a Claim for Industrial Benefit is made under this Act in respect of any Accident or disease accident or of any prescribed disease, the Minister may direct that for the in course of illegal purposes of this Act, the relevant employment shall, in relation to that accident employment. 22 National Insurance and Social Security Cap.36: (1) There shall be a General Manager of the Board, who shall be appointed Officers and by the Administration at such remuneration and on such terms and conditions (including the payment of Pension, Gratuity or other like Board. Benefit by reference to his service) as the Administration think fit. [14 of 1971] [22 of 1973] Employees of the With the approval of the Administration, the Board may employ such Officers and Employees, at such remuneration and on such terms and conditions (including the payment of Pensions, Gratuities or other like Benefits by reference to the service of its Officers and Employees) as it thinks fit, for the proper conduct of its business. 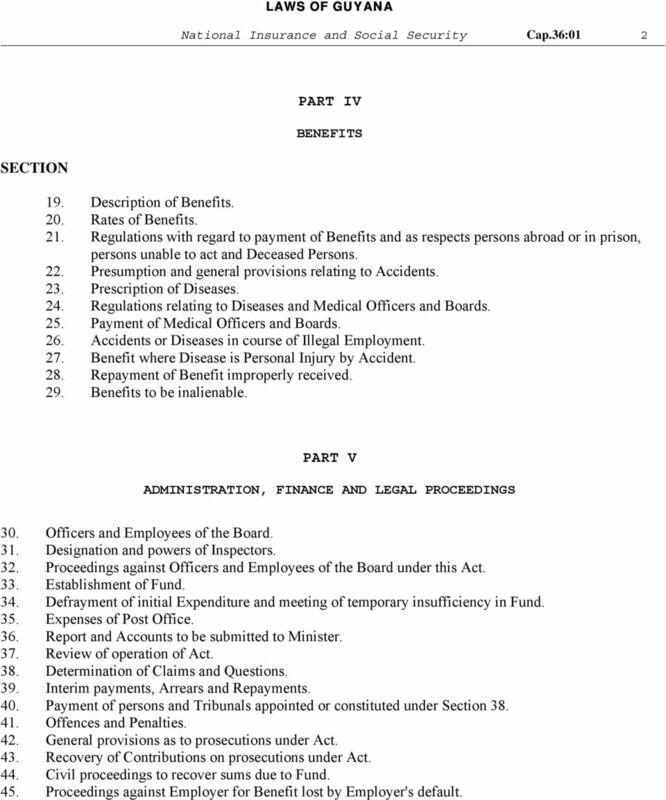 (2) Where, with the approval of the Public Service Commission, an Officer in the Public Service is seconded or temporarily transferred for duty to an Office with the Board from a Pensionable Office within the meaning of the Pensions Act, Section 5 of that Act shall apply to him as if his service in such Office were service in a civil capacity, under the Government of Guyana. c.27:02 (3) Where, with the approval of the Public Service Commission, an Officer in the Public Service has been transferred to any Office with the Board, the provisions of Regulation 21 of the Pensions Regulations (as contained in the Schedule of c.27:02 the Pensions Act) shall apply to him as if such service were other Public Service Sub. Leg. 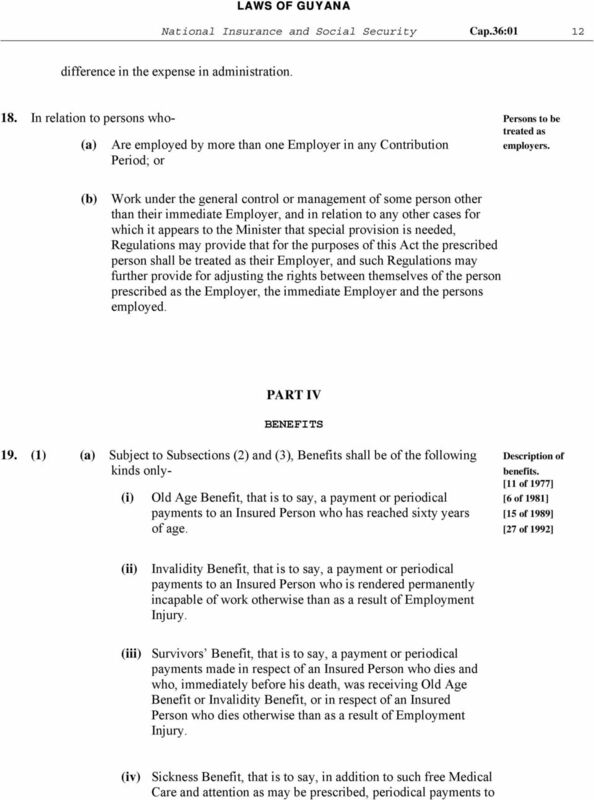 within the meaning of that Act, and the provisions of the Pensions Act shall apply to him as if such service were other Public Service within the meaning of that Act, not being service under any of the Scheduled Governments as defined in Regulation 2 of the Pensions Regulations, and Regulation 21 of those Regulations shall apply accordingly to the person transferred. (4) Except for the purpose of the performance of his functions, or when lawfully required to do so by any Court, or under the provisions of any Law, no Member, Officer or Employee of the Board shall disclose to any person any information which he has acquired in the performance of his functions under this Act as such Member, Officer, or Employee. (5) Any person who contravenes the provisions of Subsection (4), or who in the purported performance of duties under this Act obtains or seeks to obtain information which he is not authorized to obtain, shall be liable, on Summary Conviction, to a fine of five thousand dollars, and to imprisonment for a term of six months. 31. (1) The Board may designate such Officers in its service as it thinks fit to be Designation and Inspectors, for the purpose of giving effect to the provisions of this Act. Powers of Inspectors. 23 National Insurance and Social Security Cap.36:01 20 (2) An Inspector shall, for the purposes of the execution of this Act, have power to [22 of 1973] do all or any of the following things, that is to say- (c) (d) To enter, at all reasonable times, any premises or place liable to Inspection under this Section; To make examination and enquiry, as may be necessary, for ascertaining whether the provisions of this Act are being or have been complied with in any such premises or place; To examine, either alone or in the presence of any other person as he thinks fit, with respect to any matters under this Act on which he may reasonably require information, every person whom he finds in any such premises or place, or whom he has reasonable cause to believe to be or to have been an Insured Person, and to require every such person to be so examined; and To exercise such other powers as may be necessary for carrying this Act into effect. (3) The Occupier of any premises or place liable to inspection under this Section, and any person who is or has been employing any person, and the Servants or Agents of any such Occupier or other person, and any Insured Person, shall furnish to an Inspector all such information, and produce for inspection all such Documents as the Inspector may reasonably require for the purpose of ascertaining whether Contributions are or have been payable, or have been duly paid by or in respect of any person, or whether Benefit is or was so payable to or in respect of any person, and the Inspector, if he considers it necessary, may make copies of, or extracts from the documents so produced, and for that purpose, he shall have power to take possession of the documents. (4) Every Inspector shall be furnished with a Certificate of his appointment, and on applying for admission to any premises or place for the purposes of this Act shall, if so required produce the said Certificate. (5) The premises and places liable to inspection under this Section are any premises or places where an Inspector has reasonable grounds for supposing that any persons are employed, except that they do not include any private dwelling house not used by or by permission of the Occupier for the purposes of a Trade or Business. 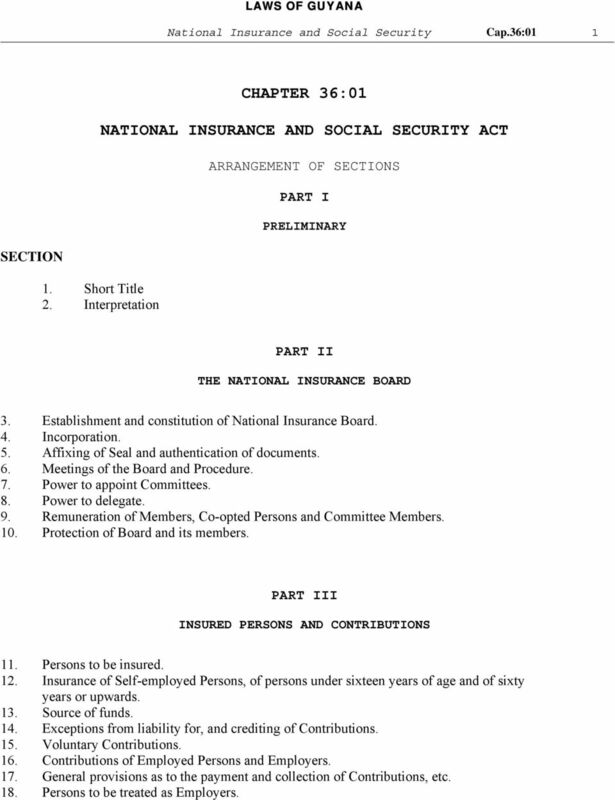 24 National Insurance and Social Security Cap.36:01 21 (6) No person shall be required, under this Section, to answer any questions, or to give any evidence tending to incriminate himself. 32. Subject to the provisions of any other Enactment, in any action or other Legal Proceedings Proceedings brought against any Officer or Employee of the Board in respect of any act done in pursuance or execution or intended execution of this Act, the plaintiff shall not recover unless he alleges in his pleading and proves at the Trial that such act was done either maliciously or without reasonable and probable cause. this Act. against Officers and employees of the Board under 33. (1) For the purposes of this Act, there shall be established under the control and Establishment of management of the Board, a Fund called "The National Insurance Fund". Fund. [14 of 1971] (2) There shall be paid into the Fund- [9 of 1981] (c) (d) (e) All Contributions; All Rent, Interest on Investments, or other income derived from the Assets of the Fund; All sums recovered under this Act, as Fines, Fees, Penalties or Costs; All sums properly accruing to the Fund under this Act including, without prejudice to the generality of the foregoing, the repayment of Benefit; and Such other sums as may, from time to time, be provided by the National Assembly for any of the purposes of this Act, or as may, from time to time be received and accepted by the Board on behalf of the Fund. 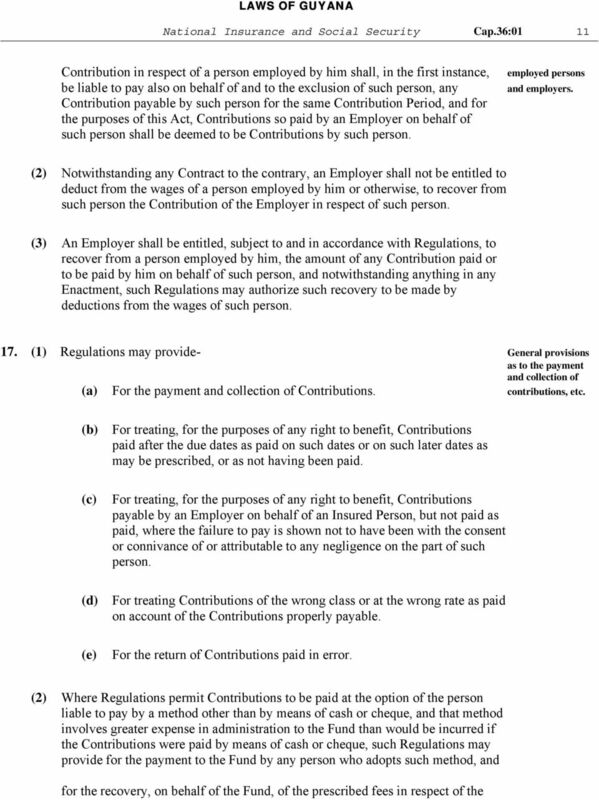 (3) There shall be paid or met out of the Fund- (c) All Claims for Benefits Refunds of Contributions paid in error All Expenses properly incurred in the administration of this Act, including Disbursements by way of remuneration, Allowances and Expenses payable under Sections 9, 25 and 40, and the Remuneration and Allowances (if any) payable to Officers and Employees of the Board. Social Security (Non-Contributory Benefits and Unemployment Insurance) NON-CONTRIBUTORY BENEFITS REGULATIONS Regulations made under s.
Regulations made under s.16 () 3.10.1955 Amending enactments Relevant current provisions Commencement date Regs. of 21.11.1961 reg. 5, 8(2), and (3) 25.6.1970 reg. 12 LNs. 1974/108 reg. 6 1978/002 Sch.